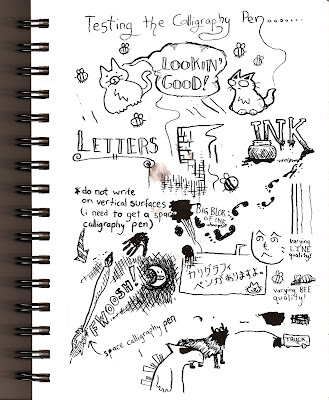 I got a calligraphy pen today, and dedicated a page of my sketchbook to just messing around with it (click the picture for more detail). The ink is really dark and I can make some really great cross-hatching with it. I'm not entirely sure of how to properly use it, and I have a few blotches and smudges, but I look forward to learning how to operate this thing.